Single pole double throw auxiliary contacts, used for low power circuit, can be utilised on the majority of our contactors. See the product catalogue for ratings. Ampere Turns is one of the factors that provides an efficient solenoid. The ampere-turn (AT) is the unit of magnetomotive force, represented by a direct current of one ampere flowing in a single-turn loop in a vacuum. Example: The ampere-turns for a coil with 1000 turns and a 500 mA current. *Magnetomotive force is any physical cause that produces magnet flux. The application form is designed to provide the information required to assess an application. Steel movable core of the solenoid, used to drive the moving contact assembly. A variety of mounting brackets are available, as seen within the catalogue sheets and website product page. Generally these are split into a ‘Top hat’ style for mounting parallel to the mounting surface or an ‘L’ shape mounting bracket for mounting 90 Degrees to the surface. Set of normally open and set of normally closed contactor. The aperture usually found in the top cover housing is sealed to form a barrier to assist prevention of airborne contamination into the contact area. Housed within the magnet frame, the solenoid (coil) is energised to generate the electro magnetic force for moving the armature and thus operating the main contacts. Our coil winding wire is Class H, rated for 180 Degree Celsius insulation. Vacuum impregnated coils are available to safeguard against shock and vibration and / or high humidity. Coil termination is typically via 6.3mm faston spade termination. Flying leads, M5 studs and other termination are available. Unit = Amp or Ampere. An Ampere is the amount of electrons flowing past a given point in the conductor in one second. Very Intermittent (HO) – Up to 25% duty Cycle, up to 3 minutes continuous energisation. Highest power in coil allowing strongest return spring to be used, giving optimum switching characteristics. Intermittent (INT) – Up to 70% duty cycle, up to 15 minutes continuous energisation. 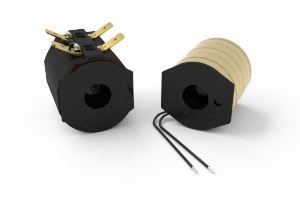 High power in coil allowing strong return spring to be used, giving good switching characteristics. Prolonged (PO) – Up to 90% duty cycle, up to 54 minutes continuous energisation. More powerful than continuous, weaker than intermittent equivalent. Return spring is stronger than continuous but weaker than intermittent. Continuous (CO) – 100% duty cycle. Continuous operation. Weakest power coil dictating that a weaker, when compared to the intermittent equivalent, return spring is used. This does not give the best switching characteristics for applications switching frequently on load. The on period over the total cycle, supplied as a percentage. Τ is the period of the function. The voltage (V) required to open the contacts (on a normally open contactor) at 20 degree Celsius. 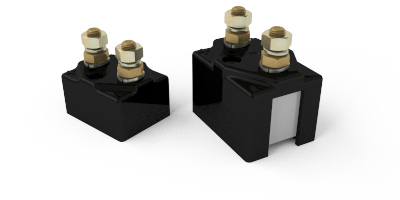 Meeting the requirements of UL583 for Type EE Trucks, these contactors are fitted with steel shrouds which create enclosures around the contact housing area. Note these are designed for EE environments and not EX hazardous locations. Placed in series with the coil via auxiliary contacts, the resistors allow a very strong initial energisation. This allows a strong return spring / coil combination to be utilised, and thus providing the best switching characteristics. Electro Magnetic Force – this is the transient voltage from the coil when it is switched off. SW180 and SW200 comes with end caps fitted as standard. SW80 series can be fitted as optional extra. UL recognised material means good resistance against flammability. Plastics used are generally UL94-V0 and used to help extinguish materials should they ignite. The non movable main contacts. Supplied as bussbar, stud or female thread termination – dependant on model type selected. How many times does the coil get energised, e.g. 2 times a day. Twice an hour. Whilst not adding to the thermal characteristics of the contactor, large tips offer significantly more contact material than the standard tip and subsequently benefit in supplying greater contact life. Inductive loads, frequent switching and such like will dictate the use of large contacts, due to the nature of contact wear. Used to assist breaking of arcs associated with high voltage. Recommended for applications of 48v (inductive) / 60v (resistive) and over. Fitted within the top cover, there is no increase on the overall dimensions. NOTE: Generally, contacts become polarity sensitive when magnetic blowouts are fitted. Steel enclosure housing the coil (solenoid), armature and other ‘coil assembly’ components. Contact position is secured with the use of a permanent magnet within the coil assembly. The coil requires a pulse(~500ms) to close the contacts, and a reverse polarity pulse (~500ms) to operate the armature and open the contacts, but otherwise remains in the last energised state without the need for power. It should be noted therefore these are not failsafe. 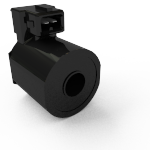 Made of fixed (stationary) and moving contacts – designed to carry the power circuit. Termination may be stud, female or bussbar depending on the contactor type and therefore dictated by requirements and type of application. Configuration for motor reversing, links supplied – will reverse the armature relative to the motor fields. When vertical, main contacts mounted above coil assembly. When vertical, main contacts mounted below coil assembly. The movable main contacts – movement provides the making and breaking of the main contacts. Contacts are open when coil is de-energised. Contacts are closed when coil is de-energised. If the contacts are breaking load, hot switching, then the contactor can be considered as opening on load. The voltage (V) required to close the contacts (on a normally open contactor) at 20 degree Celsius. Some of our series of contactors are available as protected variants, IP66 rated. Our customers expect high standards of product and Albright has set the standard for high quality of contactors, something others are trying to emulate. We operate ISO9001:2000 procedures and actively operate a continual improvement ethos. The coil resistance (Ohms) will vary dependant on the ambient temperature and coil temperature. Data provided is at 20 Degree Celsius. As our coils are wound for D.C., a rectifier can be fitted for A.C. applications. Contactors and switches supplied are RoHS compliant. See Magnetic Blowouts – High Powered. Diode or diode and series resistors are used to pre-determine the Transient Voltage to an acceptable level; however adding a diode will increase drop out time, adding a resistor will reduce the drop out time but increase the transient voltage. 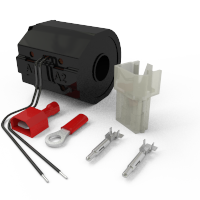 Albright manufacture their own original designs, and are continually evolving their products in view of cost reduction and new market opportunities. Technical assistance is available, either directly or via the appointed local distributor. Electrical testing is performed in house, and used to validate new and existing designs. The typical ambient temperature that the contactors can be operated within is from -20 degrees C to +60 degrees C in a 90% non condensing humidity. The expected coil temperature rise will be approximately up to +70 degrees C. This statement applies to all non magnetic latching Albright contactors, magnetically latching contactors have minimal temperature rise due to the extreme short energisation. For storage: Albright typically states that the contactors can be stored up to +80 degrees C in a dry/clean environment. A variety of coil terminations are available for the majority of our contactor, 6.3mm faston , M5 stud termination and flying leads are amongst more common. In 1986 we started UL testing of products. The Majority of materials are UL 94 V0 recognised. 1000 cycles endurance, 50 cycles 150% overload. Prevention against Shock, Vibration and high humidity. Amount supplied across the coil or main contacts, this is not necessarily the system voltage due to voltage drop in the circuit. We offer coil windings suitable for 6-240v applications. All coils are wound DC, so if used on AC supplies then a rectifier is required.